Praying for wind - and more racing. More Sunfish sailors turned out for racing today than at any other point this season. There were 8 boats on the line for the first of five races today in what turned out to be maddening winds. A half hour before racing started, there was a gusty 12 mph wind from the north that had some sailors wondering if they should go out. By race time, the winds had lightened to about 10 mph. then 9, then 8... Then the shifting started. The North wind became an East wind. Then a South wind, then a North wind again. Then it died completely. Then it filed in from the north at 10 mph, then it died again. A mark rounding took 15 minutes, followed immediately by a run that lasted about 10. You get the picture. A typical day at Massapoag. Results were pretty evenly spread about the fleet. The east side of the course, toward the center of the lake was heavily favored, and anyone who headed inland met with almost certain disaster. Leads and positions frequently changed by the leg. There was actually a mark rounding where the fleet almost completely reversed itself. The first boat to the mark was the last one to complete the rounding, and the last one to make the mark finished the rounding in third. The only skipper to have multiple firsts was Mark Stoughton, who had 3. Dan Abram, in his second Sunfish outing, took one and John Houstle fended off late attacks from Mark and Alan Dimson-Doyle to take a first in the last race. Sunfish racing rookies Skip Russell and Alan Dimson-Doyle each had strong showings today, continuing to show marked improvement over the course of the season. In the opening race of the day Skip took a second and in the finale Alan Dimson-Doyle took a very close third. There have been 50 races run so far in the Summer Series. Two points separate the first three places. Bernadette Levesque leads the fleet with 52 points, Mark Stoughton is one point behind with 53 and Rick Schlosser is in third with 54. John Houstle is in fourth with 61. Full results are here. What was to have been the last week of Sunfish racing turned out to have the best turnout of any week this season, and culminated with a request by many of the sailors to continue racing past today's end date and continue on into September! 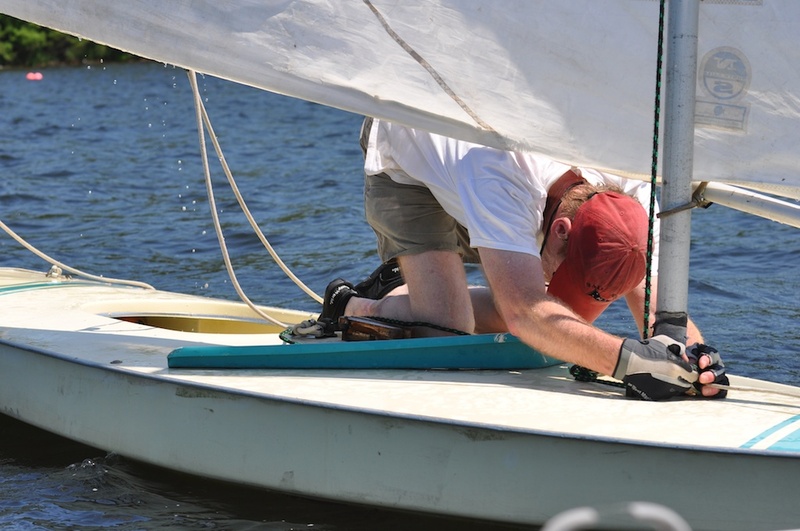 Skippers agreed to take turns service as Race Committee each week. So we will take next two weeks off because of the club's Labor Day activities and the 64th MYC Annual Regatta (You're all coming, right?? ), then the Saturday races will resume!